Visualizing how tax works by applying engineering methods. The strange thing though is that researching the subject has unearthed different papers that essentially use the approach I want to follow. I guess this is not the approach per se that is wrong, but my own take on it. I'll try to realign my presentation towards a more concise and elegant approach as suggested by the anonymous scholar. My (restated) goal is to construct a simple mathematical expression that calculates the tax owed in function of all necessary parameters. I found in "Effective Federal Individual Income Tax Functions: an Explanatory Empirical Analysis" a citation that summarizes the approach I want to follow in a concise way: "... a tax law is a mapping from a vector whose elements are the income characteristics of the individual (wage income, dividends, capital gains, and all the other items in the income tax form) to tax liabilities. It is supposed to be a well defined function; ..." taken from Arrow, Kenneth J. "Microdata Simulation: Current Status, Problems, Prospects." in Microeconomic Simulation Models for Policy Analysis, New York: Academic Press, 1980. While deductions and exemptions reduce your income, credits directly reduce your tax itself. As such credits are better, their effect doesn't depend on the marginal rate. Formally, the effect of credits can be reflected in a new tax equation. The most important credit is the earned income tax credit (EITC). The EITC is a very special tax credit, it is refundable, in other words if you end up with a negative tax, the government will effectively send you back some money. Note that this is different from a refund, the EITC is only valid for low income taxpayers and correspond to a work incentive, in a certain range of income, the government chips in some extra money towards your disposable income. The EITC is one of the largest aid programs, as mentioned in "Behavioral Responses to Taxes: Lessons from the EITC and Labor Supply"
In fact, the EITC is the largest cash transfer program for lower-income families at the federal level. An unusual feature of the credit is its explicit goal to use the tax system to encourage and support those who choose to work. The next figure is extracted from the same document (based on values provided in table 13-14, Green Book, 2004, Joint Committee on Taxation, Ways and Means Committee) and shows the evolution of the EITC. To put things in perspective, the total amount of individual tax liability is about 800 billions in 2003. As alluded, the EITC increases with an increase in income, mathematically this means negative marginal rates, i.e. 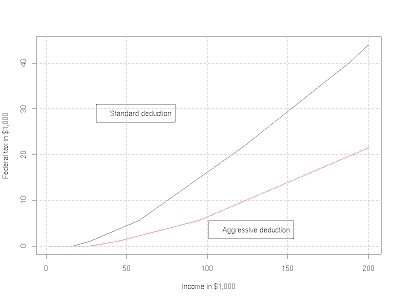 your tax decreases (in this case becomes more negative) as your income increases. The exact rates are variable and depend on the phaseout characteristics of the EITC, this will be discussed in the more general article on phaseout effects. The rates at a given income are now dependent on the deductions and exemptions. In other words, two taxpayers with the same income and filling status can be taxed wildly differently, based on which deductions and exemptions apply to them. Obviously also, people are aware of this and may adapt their lifestyle to maximize deductions, at least when possible. This is in some sense, why deductions are introduced in Congress, but sometimes with unintended side effects. An obvious side effect is to introduce societal tensions between people able to claim specific deductions and people unable to claim them. A second side effect is the complexity of the rules needed to administer the different deductions, impacting both the taxpayer and the IRS. An extreme example compares the federal tax and corresponding average tax rate for two couples filling jointly in the figures below. The first couple has no kid and don't itemize deductions, the second couple has three kids and itemize major deductions that scale as a percentage of the income: 7% state tax, 25% of mortgage interest and 7.5% of medical expenses (their total medical expenses is 15% of income, the first 7.5% cannot be deducted). 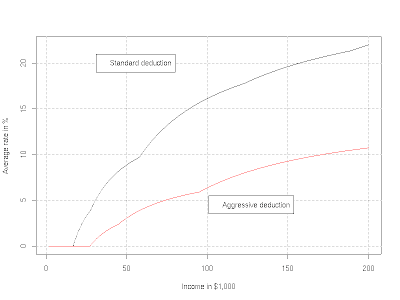 Because in this model the deductions are proportional to the income, the two curves diverge, asymptotically the ratio between the marginal rates is 1 - the total percentage of deductions, or about 0.6 in the example. It is a matter of discussion if such a difference makes sense, i.e. is it equitable to favor specific behaviors though differences in taxation rates? And the difference is huge, the next figure shows the ratio between the tax paid by the couple with three kids and using aggressive deductions and the tax paid by the couple with no kid and using the standard deduction. 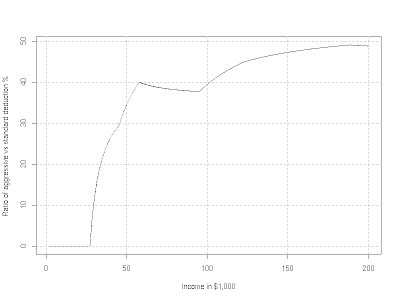 The ratio never even reaches 50% for the range of income considered here, with the asymptote at 60% as explained before. Deductions can so much reduce the tax paid that two different mechanisms are in place to avoid their abusive use: phaseouts and the Alternate Minimum Tax (AMT). Both of these will be discussed later on, after an article on tax credit. The tax is dependent on income, but what exactly is the income used in the tax equation? Well, this is where the difficulties begin. Tax laws come from Congress that cannot resist its urge at pleasing specific parts of the population by introducing tweaks, normally in the form of deductions linked to specific conditions like marriage, house ownership, children, .... The base principle becomes the tax law that is then formalized in specific rules by the IRS, i.e. what is the definition of a kid. Because the world is not as regular as can be expressed in a law, the IRS rules are complex, full of details that apply probably only to a very small percentage of cases but still must be detailed in the instructions booklets written by the IRS. * presto, you have your adjusted gross income. Of course, this is where the pain starts, you as a taxpayer, have to assemble all the information needed to correctly assess your taxable income, but also to substantiate your deductions. The IRS estimates are that filling a 1040 form requires 30.3 hours of which 19 hours are for record keeping. If you can take 2 hours a day after work, this requires two full weeks of work. The IRS also estimates the average cost at $269, but this probably assumes your time is free. No surprise this is called a burden. Of course, the IRS is part of the problem as the rules are at best complex. Just an example, line 42, Exemptions has special treatment for persons displaced by Hurricane Katrina. This probably comes from a good intention, but a first obvious remark is that this is only a very small part of the population, but it impacts all taxpayers (you have to read the instructions). * main home, what if you have contributed a cottage that is on the same piece of land as your main home? * 60 consecutive days, what if the displaced person traveled for one week, say to New Orleans, is it still consecutive. If you remember that the displaced person was there in January and February, can you positively remember that he or she was there for 60 days? This is not directly a critic of the IRS, but of the whole process of trying to carve out special cases. Every special case comes with a set of rules and all these rules will probably raise a number of secondary questions that may end up as more rules and the cycle never ends. After a few years of this, you need 30 hours to fill your tax form and everybody hates filling the form. But this derails us from the goal, a mathematical treatment of the tax equation. Mathematically, deductions and exemptions correspond to an offset. 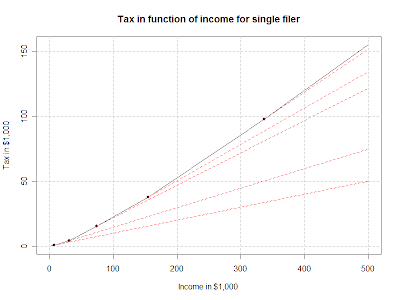 Essentially pushing the tax curves to the right when using the taxable income for the x axis. This will be further discussed and illustrated in a next article. From the definition of the statutory tax rates, it is possible to write a tax equation, giving the tax owed in function of the income, the tax brackets and the filing status. The marginal rate is the ratio between the increase in tax owed and an increase in income. Using the tax equation, the marginal rate is the partial derivative of the tax equation over the variable I. As expected, the marginal rate is simply the statutory rate at this stage. If wanted, partial derivatives over different variables provide solutions for other form of increase, e.g. if the start of the 10% bracket is changed, what is the corresponding increase in tax. Statutory tax rates are the most fundamental part of the tax. They give the form of the tax curve, i.e. how much tax you have to pay in function of your "income". The tax curve defined by the statutory tax rates is very simple, the complexity will come later, introduced by a large number of tweaks, in the form of deductions, exemptions, credits, phaseout, and other goodies we'll also tackle in this blog. The US, as most countries, use progressive tax rates, that is both the tax and the tax rate increase as your income increase. The statutory tax rates are marginal tax rates, they indicate the ratio between an increase in tax and an increase in income at a given income level. 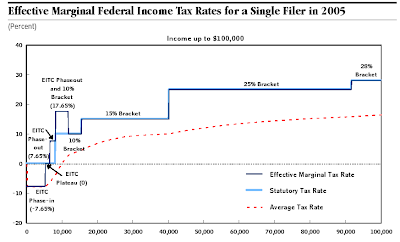 Mathematically, the marginal tax rate corresponds to the derivative of the tax curve, or equivalently the tax curve is the integral of the marginal tax rates. The statutory tax rates are dependent on the filing status and adjusted for inflation. The 2006 schedule of statutory tax rates are summarized in the table below. As the statutory tax rates are piecewise constant, the tax curve is piecewise linear, i.e is formed of line segments connected together as shown in the figure below. 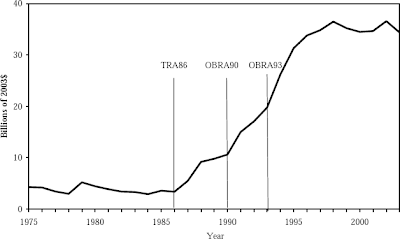 The black curve shows the tax paid in function of the income, the red curves shows each segment extrapolated, illustrating the slowly increasing rates characteristics of a progressive tax system. Mathematically, the curve appears to have a positive second derivative. The first derivative however is not continuous, but piecewise constant with discontinuities at the tax bracket boundaries. This is not a big problem in practice, except that it introduces impulses in the second derivative, and generally only discussion of the first derivative makes sense. The tax curve is directly expressed in monetary units and so in some sense is the most concrete of all, but it has the inconvenient of being continuously increasing, so that details close to the origin are lost. Two alternate ways of presenting the same information with less scale problems is to use either the first derivate (the marginal rates) or the average rate (the tax divided by the income). The next figure shows both the marginal and average rate for a single filer. That the average rate is always lower than the marginal rate is normal for a first derivative that is monotonously increasing. The specific form of the average rate will be discussed in a next article. It is once more begin of January, tax forms start to trickle. And yet again, I'm reminded of the difficulty of preparing my annual tax return. I'm especially taken aback by the style of the IRS documents, especially the instruction forms. I'm an engineer, trained to use mathematics as a tool, adept at reading technical documents where graphical elements are used to enhance comprehension. But obviously IRS instructions are cast from a different mold. A serious peeve, from an engineering standpoint, is the wordiness of IRS documents, especially when describing what are in essence simplistic mathematical expressions, coupled with an almost total absence of explanation for the rationale behind some of the tax rules. And of course, I'm appalled to see page after page of tables that seem to be nothing more than a tabulation of simple linear equations. This blog wants to apply mathematical concepts to give visual explanations of tax rules and to show that their form does (or sometimes doesn't) make sense. 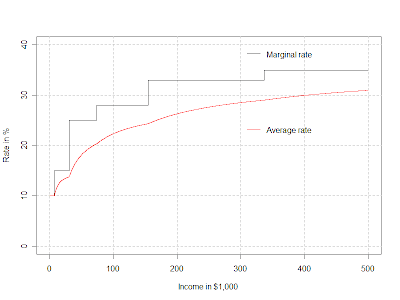 A first sequence will tackle the concept of marginal rates, with the explicit intention of explaining how the curve below, extracted from "Effective Marginal Tax Rates on Labor Income", a Congressional Budget Office document, can be recreated. The CBO is a government office. As such the documents it produces are not copyrighted. This is confirmed by an explicit copyright policy, that however requires correct attribution. So please mention the CBO origin if you want to use the above chart elsewhere. I'm an engineer with a fascination for financial subjects.